It’s Chinese New Year and there are fireworks going off in the town of Palm Beach. Local DJ Adam Lipson is pumping out dance tunes, the cocktails with kitschy umbrellas are flowing past fierce red lions, huge paper lanterns and large statues of Buddha. 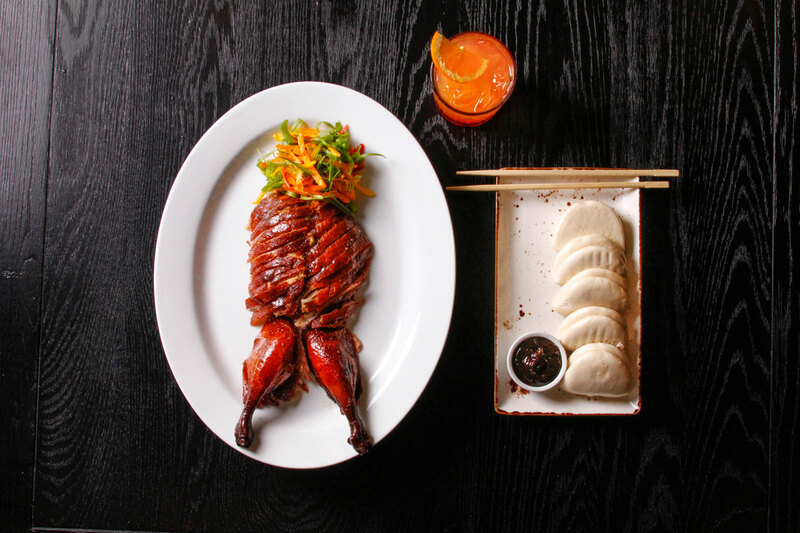 Overflowing steamy baskets of dim sum are making the rounds while tattooed waitresses in clingy black dresses swoop in with steamy plates of noodles as couples in kimonos clink glasses at the neon-lit bar before tucking into a Peking pig roast. It is the Year of the Pig after all and customary to celebrate by eating one. Welcome to Hai House, the newest – and only – Chinese American cuisine on Palm Beach’s tony Worth Avenue. 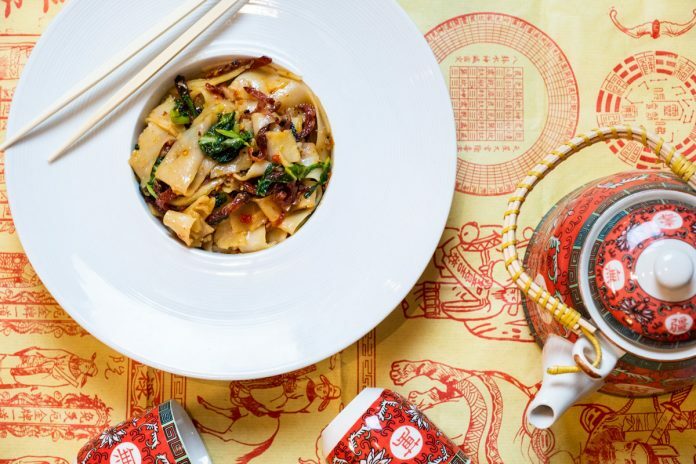 Chinese has never gotten the high energy fun house experience that Japanese food has here, but Hai House aims to change that, helmed by executive Chef James Strine, an industry veteran who boasts classical French training that landed him in the kitchens of Café Boulud, Buccan and Grato. Located on the second floor of The Esplanade at 150 Worth, the roomy eatery has a dim sum counter, a lounge-y private dining room with couches, a takeout space and a full bar. Enormous pots of orchids bloom on counters and tables, while black and white patterned wallpaper lit with lavender neon gives an edgy cool vibe. Circular tables have a marble lazy susan in the middle, an old school update that makes it easy to give it a spin and share the trays of sweet and hot and soy sauces along with family style noodle plates and bottles of wine. A full taste of the Hai House’s menu starts with Wonton, egg drop, or hot and sour soup. The Hot and Sour has been reimagined as a thick rich broth full of chunks of roast pork, the tangy sour note delicious and mysterious. Also delicious is the Crab Rangoons nestled in an orange duck sauce, the pop of crab and vegetables in a creamy sauce is balanced by a crispy shell. Everyone loves dim sum, and the presentation in a little steamy bamboo basket is a delight. Filled with pork, shrimp or tofu, the real key here is to mix up a custom sauce with the citrusy duck, soy, hot mustard and chili oil provided on the table. Swirl it on your plate and get the mix just right. The tofu dim sum is particularly good with a big satisfying bite inside the steaming pinched noodle. In an update of “one from column A one from column B”, Hai House allows you to choose your protein – beef, pork, shrimp or tofu – then choose a style – General Tso’s, Kung Pao, Sweet & Sour, plus a choice of stir fried noodles or rice. Vegan options abound. 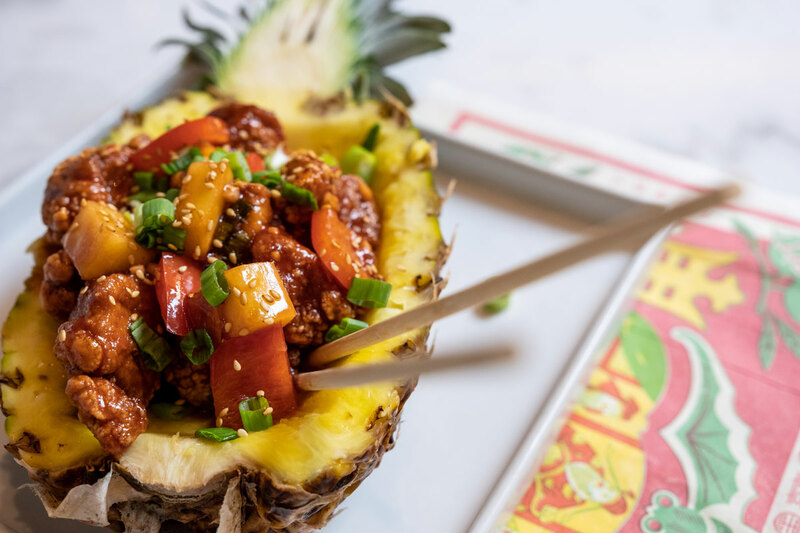 The best surprise is the Sweet and Sour style that comes in a hallowed-out grilled half pineapple. Talk about presentation, this is so rarely done anywhere that it is a total delight, not to mention a wonderful flavor addition to the stir fried bell peppers and onions. There is a full bar at Hai House that offers innovative, handcrafted cocktails with names like The Warm Wall, Shanghai Sling and Long Long Life, as well as a curated wine list and authentic Chinese beers like Lucky Buddha, brewed & bottled at the Thousand Island Lake in China. The lively atmosphere has become a regular event at this restaurant. Hai House is now in full swing and invites guests to enjoy the “Feast of Good Fortune”, a five-course prix fixe menu featuring traditional Chinese New Year dishes until February 19th. The prix fixe menu is $65 per person. Dinner is served from 4 p.m. to 10 p.m. Monday through Sunday, with an extensive Happy Hour served throughout the dining room from 4 p.m. to 6 p.m. daily. Hai House is located in The Esplanade at 150 Worth Avenue, Suite 234, in Palm Beach, and offers complimentary valet parking. More information is available at HaiHousePB.com. 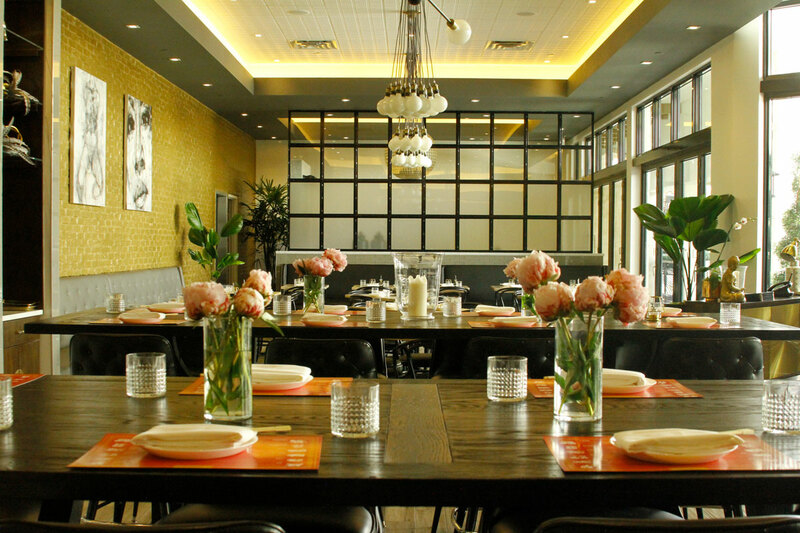 Hai House: Exotic Chinese American dining, taking Palm Beach by storm. The restaurant features modern Chinese American cuisine, cocktails, and dim sum.